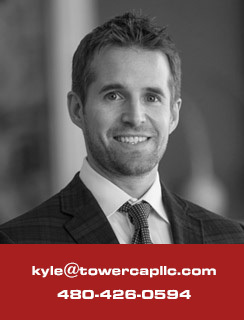 Prior to founding Tower Capital, LLC, Kyle spent four years at Artemis Realty Capital, LLC where he served as Director and Member of the Investment Committee. While at Artemis, Kyle assisted in launching a closed end fund which provided short-term loans on certain types of commercial real estate assets in the Southwestern United States. While at Artemis, Kyle was directly involved in the execution of over $165 million in investments for Artemis which included funding of over 6,500 value-add multifamily units in the Southwestern United States. Preceding Artemis, Kyle served as Vice President at Merrill Lynch where he held a series 6, 63, 66, 7 and Life and Health Licenses. In addition to evaluating potential investments for his clients, he also originated construction and CMBS loans for Merrill’s debt platform. Earlier in his career, Kyle worked at New York Life providing long-term investment analysis, retirement planning and corporate benefits. Kyle is actively involved with the Urban Land Institute (ULI) and National Association of Industrial and Office Properties (NAIOP). He graduated with a degree in Business Management from Arizona State University with an emphasis in finance, investments and marketing.